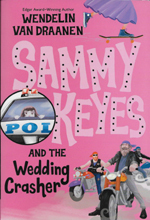 "In the 13th installment (Knopf, 2010) of Van Draanen's middle-school mystery series, the beginning of eighth grade brings a slew of surprises for Samantha Keyes. For one thing, her minor role in Officer Borsch's wedding has been upgraded to bridesmaid. But trading in her high tops and jeans for sparkly heels and a frilly princess dress in the least of her worries. Her mother is dating the father of the boy Sammy has a crush on, a boy who happens to be the brother of Sammy's arch-enemy, Heather. Her best friend's family is falling apart. And someone is leaving death threats for her despised history teacher, Mr. Vince, with Sammy herself the number-one suspect. Fortunately, Sammy is just the sort of girl who will be able to put together all the clues and clear things up, even if she has to look like a fairy godmother while she does it. Tara Sands brings Sammy's energetic, wisecracking voice to life, and skillfully portrays the many other characters. Highly recommended for school and public libraries."